i will register with your link. your information was very useful. i am glad for the informative post. FastCashMining came through with another payment. This is Payment number 5 and $15.86 earned in total. If doing this on mobile & Google Chrome is currently installed, can it be done this way - by installing Firefox & use it only for the autosurfers? You can use the site on any browser. Having firefox and chrome in your phone isnt a problem. You have to keep your phone on the mining tab of course. Means if having a few sites already running on a few tabs on Google Chrome, it is still possible to run a few more tabs for the autosurfers without Firefox? A big "Thumbs Up" for the admin at CashCreator.de. I had a problem with my account so I sent an email. Very quick response and the problem sorted out. It's very comforting to know that there is an attentive admin. I've just upgraded to Silver and should reach withdrawal in the next 2 weeks. Please let me have the email address that this email came from. 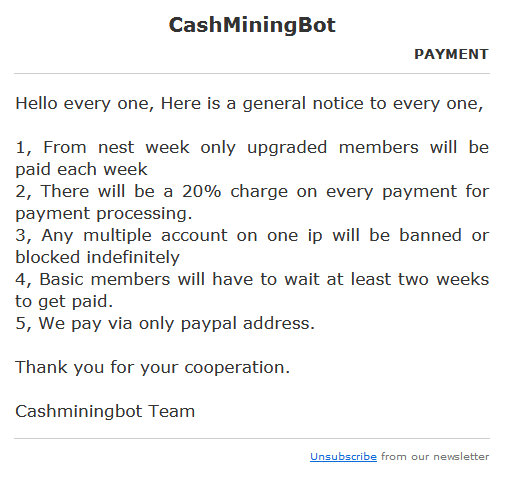 I have some questions for the CashMiningBot Team. It displays banners each time a new page is loaded and since the cash miners refresh every minute or so that is a lot of banners you get paid for. I received the e-mail from [email protected]. Fast Cash Mining - Earn money from home! Join today and start mining cash! Using this website you get paid every minute by doing nothing but to keep an window open. Start mining cash today! This is the only one that pays with paypal payeer and btc. it pays 0.00015/min but you gotta pay at least 1 dollar to withdraw or buy a higher membership. there might be other sites that pay with payeer but this is the most profitable. Hello I have a question. I'm looking to withdraw from fastcashmining to bitcoin, and then to transfer that to paypal, is coinbase the only option? and are there any crypto sites that do not require ID verification? Lets see if this rily works, I did setup a vps with x of this websites. You'll probably end up being banned when you request a payout since using a VPS is not allowed. My latest payment from GetCashFree. You can find a full list of sites at this site. The only ones that pay in Payeer are FastCashMining, GetCashFree, PaidForMining, and Moneyspais. I have been paid by the first three plenty of times, including within the last fortnight, so I can confirm that they are still paying. I don't know about Moneyspais as I don't use it. NEW cashpub.club REVIEWS: SCAM or LEGIT? NEW Cash2PM.is Reviews: SCAM or LEGIT?